Smartphones are designed to help us keep in contact with the people we love the most— our friends and family. But this small device can potentially also help us be closer to an even greater love: God. There are several apps on the market for both Android and Apple devices that will help you study scripture, pray more often, and live out your faith. Here is one of our favorite praying apps - Praying.Works. Praying.Works is basically a social networking platform for people that want to get closer to Jesus and God. Praying can change the world, so if you want to be a part of this movement, this praying tool is the right way to go. Created with friendly user interface and suitable for both Android and iOS devices, Praying.Works lets you pray and experience answers to your prayers. Praying.Works integrates the latest churchtech in a very unique way, combining social features with praying through your mobile devices. It is primarily designed to help individuals, families, ministries and churches to pray. 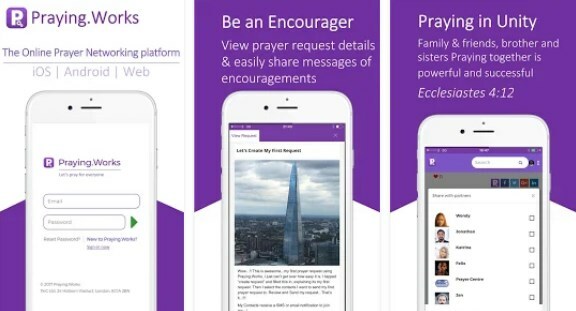 Now you can create your own prayers and have a Bible right at the tip of your fingertips. Simply invite your loves ones and become the encourager they need. Or get help when you need one – they will be able to share their prayers for you as well. You can pray alongside your friends, family and others, wherever they are in the world and experience answers to your prayers. Praying.Works allows you to add prayer details, integrate any Bible verse you want, to set reminders, publish dates, accept prayer invitations, share encouragements, control group membership, restrict re-sharing of your prayer request, and so on. If you want to be a part of this inspiring community, click one of the following links that suits your device and get the app for free.